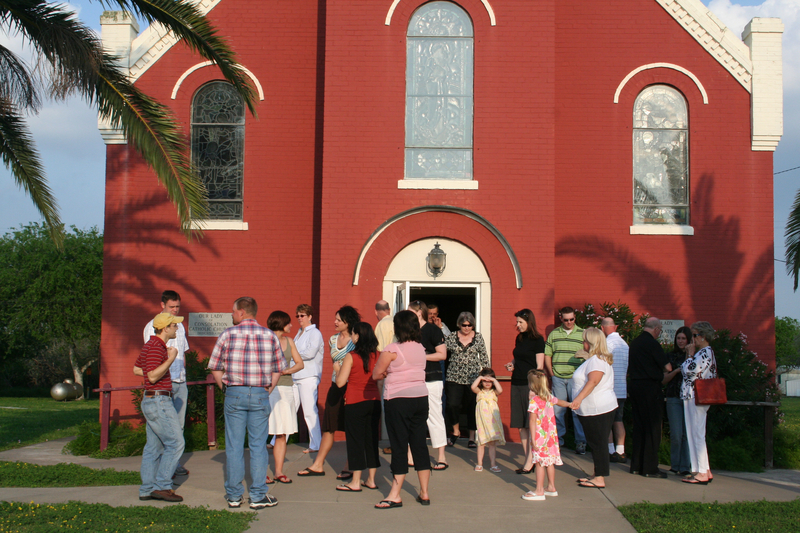 Parishes are a special form of human community. At the heart of every parish is a motley crowd of ordinary people, each with an individual sense of self as well as a different capacity to perceive or ignore calls from the outside. Every parish I have been part of has some people of extraordinary openness and wisdom as well as some as open and wise as a brick wall. Just as each parish is unique, each constituent member is unique. Each one got there through a formation process of family and friends, rivals and enemies. What shows up in any parish is a mysterious collection of human beings. A lot becomes clear as we realize that we in the church really are a rich collection of folks, and not at all defined by specific rational or theological positions. Then we ask people to plot their responses on a graph with the horizontal axis representing the first question and the vertical axis representing the second question. When I have done this exercise with congregations all across the country, we see how diverse we really are even though EVERY possible position on the graph is well within what people see as an orthodox expression of faith. 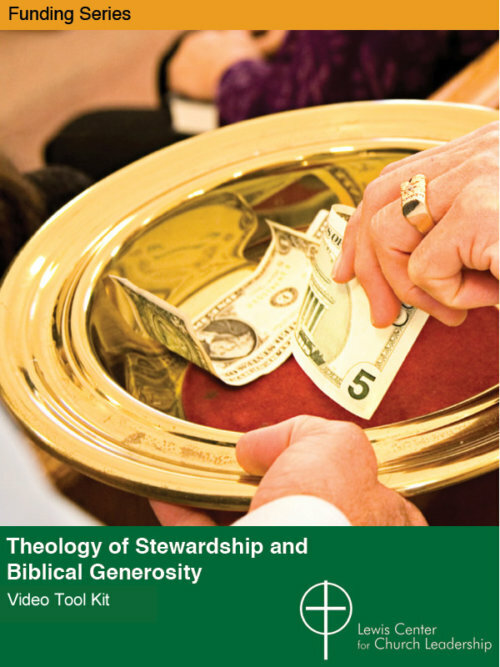 A lot becomes clear as we realize that we in the church really are a rich collection of folks, and not at all defined by specific rational or theological positions. The overall shape of the graph is that of a cross. And the crucial dynamic of every congregation is that people’s positions on this graph are not stationary, but moving, as if in orbit around the center of the cross. We are drawn back to the center of the cross when we are renewed in the activity of worship. The four quadrants are different, of course, and most of us tend to be in one or another over a period of time, although we do change from time-to-time. 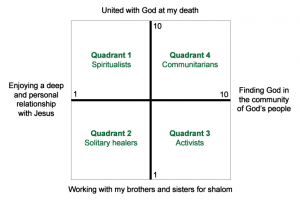 Quadrant 1: Spiritualists. These people want to go deep with God. They are seeking an experience of the presence of God. They are drawn to prayer groups, spirituality. Quadrant 2: Solitary healers. These people are rarely group-oriented. They are often the people who go to the early service on Sunday, then slip out and skip coffee hour. These people tend to work alone. Some doctors and business people are found here. Quadrant 3: Activists. These people see things that aren’t right, that people suffer from injustice and poverty, and get engaged to try to make it better. 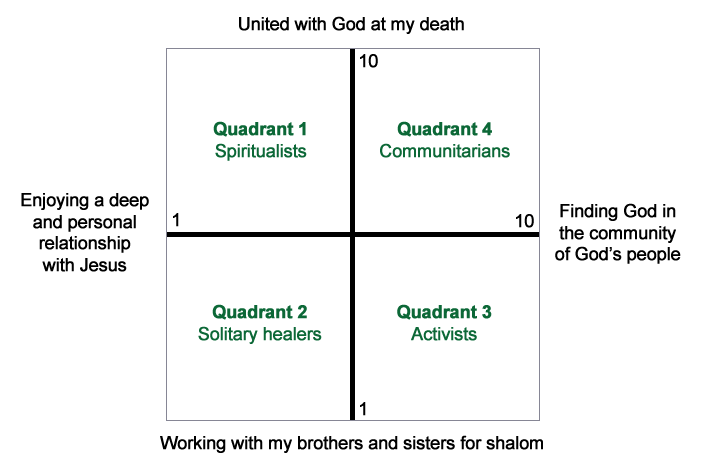 Quadrant 4: Communitarians. These people know that the state of the whole community, the congregation, is important. They want to build it up, increase its membership, bring in people, make the board really work. A parish with any of these quadrants empty has a hard time. Having them full doesn’t guarantee peace and quiet (for example spiritualists and activists are often somewhat at odds with one another), but it covers the bases. And it makes the worship rich and varied, strengthening each member with different ways of seeing things. I have come to think of a parish metaphorically, rather than try to pin the mystery down. A parish is like a large, brilliant, clear prism sitting on a table with sunlight pouring in from the windows on every side. We know how prisms act in such a situation. They multiply and enrich the light and the color. They catch the light and refract it, splitting it into all the colors of the spectrum. The stronger the light, the more spectacular the colors that come out and sparkle on the walls. What seems to be a small piece of glass generates a kaleidoscope of color. One light, but many facets. Many colors. So, too, for our parishes. There are multiple quadrants and even more individuals within those quadrants. Individuals orbiting around the center, the cross; being restored and strengthened by the center. But the light is one light. The calling we all have, the calling to belong to the One who is the light, the light of the world. This article is adapted from Loren Mead’s most recent book, The Parish is the Issue: What I Learned and How I Learned (Morehouse Publishing, 2015) and available at Cokesbury and Amazon . The material is used with permission. Spiritual but Not Religious. Really? by Lovett H. Weems, Jr.
Loren B. Mead (1930-2018) founded the Alban Institute in 1974. 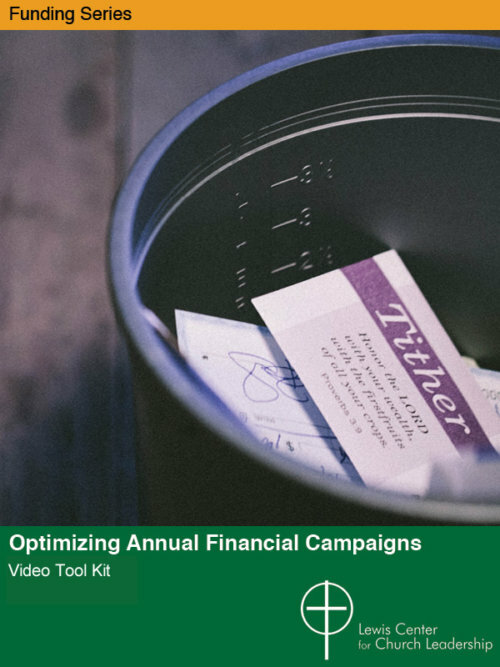 He wrote several landmark books in the 1990s: The Once and Future Church, Transforming Congregations for the Future, Five Challenges for the Once and Future Church, and Financial Meltdown in the Mainline? His last book was published in 2015: The Parish is the Issue: What I Learned and How I Learned It.